This Swarovski pure pink topaz diamond trinity ring in 14K white gold from Apples of Gold Jewelry offers a beautiful, bubble-gum pink topaz gemstone in the center of six stunning and sparkling diamonds. 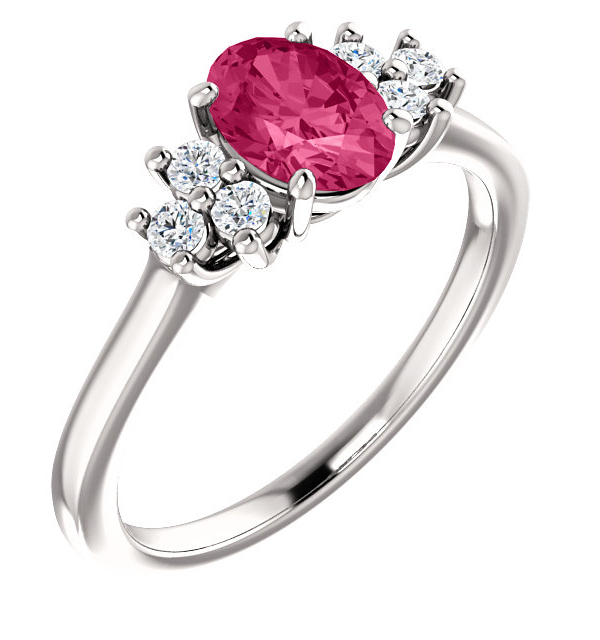 The 7mm by 5mm Swarovski pure pink topaz gemstone is an oval-cut stone and rated AA. The authentic gemstone is surrounded by six diamonds - three on each side, totaling 0.18 carats, and rated G-H for color and SI1-SI2 for clarity. This gorgeous ring features perfect feminine touches and is sure to become a favorite, whether it be for the beautiful setting work to hold the gemstone in place, the bright pink color of the stone, or the glittering diamonds on the side! We guarantee our Swarovski Pure Pink Topaz Diamond Trinity Ring to be high quality, authentic jewelry, as described above.